Home » Blog » Shows & Events » Free Concert in The Milk District! Free Concert in The Milk District! 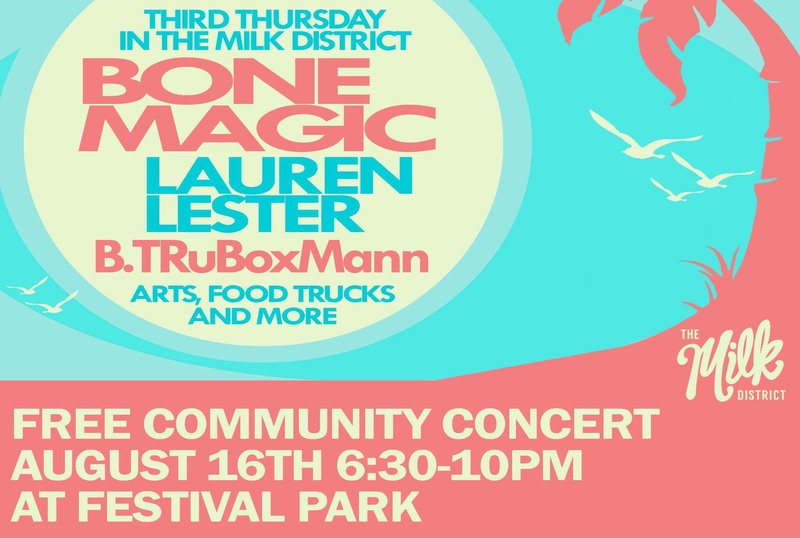 Join us for a FREE community concert on 8/16, featuring Bone Magic, Lauren Lester, and B.Truboxmann! Plus arts and artisan vendors, food trucks, and tasty crafts from Orange Blossom Brewing Co. and Tito’s Handmade Vodka! All proceeds benefit The Milk District Main Street Program and will go towards improvements to Festival Park. This FREE event is made possible by our amazing sponsors. Thank you National Real Estate – Fidelity National Title of Florida – Milk District – Scott Fosgate Mortgage Team at FBC FBC Mortgage, LLC – Divine & Estes PA – City of Orlando Families Parks and Recreation Department.